At Lower Heath, the children are involved in a number of inter and intra-school sporting events. We aim to develop children's love of sport, enhance their heath and fitness and help children take advantage of the physical, emotional and social benefits of sport. Read below details of any recent sporting activities our children have been involved with. 27 children from Lower Heath competed in the Thomas Adams cross country competition. All the children did fantastically well. Congratulations go to Evie, Connie, Bertie, Alfred, Jack and James who qualified for the next round of the 'School Games' competition which will be held in February. 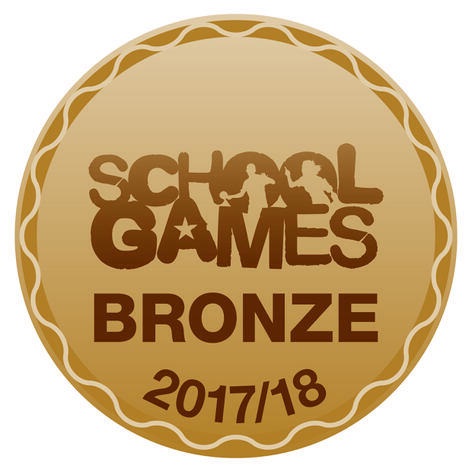 The School Games Mark is a Government led award scheme launched in 2012, facilitated by the Youth Sport Trust to reward schools for their commitment to the development of competition across their school and into the community, and we are delighted to have been recognised for our success.We are extremely proud of our pupils for their dedication to all aspects of school sport. Children in years 3-5 travelled to Sir John Talbots School to take part in a rounders competition with children from Tilstock school. The children were split into six teams and all played each other. Well done to all involved - especially the Lower Heath teams who were overall winners and runners up! Children in years 3-5 travelled to Sir John Talbots School to take part in a netball competition with children from Tilstock school. The children were split into six teams and all played each other. Well done to all involved - especially the Lower Heath team who were overall runners up. On the evening of Wednesday July 4th, 2 of our pupils: Ffion and Sophie, competed for North Shropshire East in the Shropshire Schools' Swimming Gala held at The Quarry Pool in Shrewsbury. The girls represented their region and their school exceptionally well. On Friday June 22nd, we held our school sports day. In the morning, we held competitive house events. KS2 enjoyed inter-house cricket, whilst KS1, enjoyed multi-skills races. Well done to Green team who won the Year 3/4 Cricket and Red team who won the Year 5/6 Cricket. We followed this event with a sponsored skipping event for The British Heart Foundation. All classes learnt to skip and ropes are now available at break times to continue this excellent activity. In the afternoon, we held our athletics sports day. This was a very closely fought competition but Red team were the final winners. Well done to everyone for a fun, active and rewarding day. All children from Year 5 participated in a 'Mini Olympics' event held at Sir John Talbots School. They had a fantastic afternoon and competed in mixed teams with other schools. Children from Lower Heath took part in the North Shropshire East Schools Swimming Gala at Market Drayton Swimming Centre. The children participated extremely well and 3 children were selected to represent North Shropshire East at the Shropshire Gala held on the 3rd of July. Our Year 5/6 football team took part in the finals day of the North Shropshire Schools Football League in Oswestry. After playing several closely fought games, our fantastic team reached the final and successfully brought home the winners' trophy!! Well done to all the players and to Mr Davies for supporting and encouraging them. Thanks also to SJT for kindly providing the transport to and from Oswestry. Our KS2 football team took part in the first 2 matches of the North Shropshire Schools Football League on Thursday in Oswestry. The team played exceptionally well- drawing one game 0-0 with Oswestry and winning 4-1 against St Martins. Well done! We wish you all the best with your next set of matches which takes place next Thursday. On Wednesday, we held our KS2 inter-house handball competition. After a close set of matches played in an excellent spirit, Green team emerged as winners in both the Year 5/6 and Year 3/4 competitions. Well done everyone involved. 3 children: Henry Appleby, James Sanderson and Jack Warner, took part in the Shropshire School Games event at Shrewsbury Sports Villiage to represent North Shropshire. They conducted themselves very well - congratulations on a fantastic achievement. The boys all qualified from the KS2 North Shropshire Cross Country Event in February. On Tuesday 10th of October and Tuesday 17th October, Children in Years 3-6 participated in series of friendly football matches against Moreton Say Primary School. The children represented our school exceptionally well and played very well. On Wednesday 18th October, children from years 3-6 represented Lower Heath at the North Shropshire Cross County event at Thomas Adams School. All the children did marvelously well with several of our children going on to represent North-Shropshire at the School Games in February. On Tuesday 5th of December, a group of 10 children represented our school at the Severndale Inclusive Football Event held at the 5-a-side football pitches in Shrewsbury. This event as well as giving the children a sporting opportunity, gave children the opportunity to interact with children from Severndale Special Education School.